The Sykes-Picot Agreement of 1916 was a secret agreement between the governments of the UK and France, with the assent of Imperial Russia, defining their respective spheres of influence and control in Western Asia after the expected downfall of the Ottoman Empire during World War I. It was largely a trade agreement with a large area set aside for indirect control through an Arab state or a confederation of Arab states. The agreement was concluded on 16 May 1916. It did not contemplate the assignment of any League of Nations mandates, since the League and its mandates were developed during the post-war period. The terms were negotiated by the French diplomat François Georges-Picot and Briton Sir Mark Sykes. Britain was allocated control of areas roughly comprising today's Jordan, southern Iraq, and a small area around Haifa, to allow access to a Mediterranean port. France was allocated control of south-eastern Turkey, northern Iraq, Syria and Lebanon. Russia was to get Constantinople, the Turkish Straits and the Ottoman Armenian vilayets. The controlling powers were left free to decide on state boundaries within these areas. The region of Palestine was slated for international administration pending consultations with Russia and other powers, including the Sharif of Mecca. Lord Curzon said the Great Powers were still committed to the Reglement Organique Agreement regarding the Lebanon Vilayet of June 1861 and September of 1864, and that the rights granted to France in the blue area under the Sykes-Picot Agreement were not compatible with that agreement. The Reglement was an international agreement regarding governance and non-intervention in the affairs of the Maronite, Orthodox, Druze, and Muslim communities. In May 1917 W. 0rmsby-Gore wrote "French intentions in Syria are surely incompatible with the war aims of the Allies as defined to the Russian Government. If the self-determination of nationalities is to be the principle, the interference of France in the selection of advisers by the Arab Government and the suggestion by France of the Emirs to be selected by the Arabs in Mosul, Aleppo, and Damascus would seem utterly incompatible with our ideas of liberating the Arab nation and of establishing a free and independent Arab State. The British Government, in authorising the letters despatched to King-Hussein before the outbreak of the revolt by Sir Henry McMahon, would seem to raise a doubt as to whether our pledges to King Hussein as head of the Arab nation are consistent with French intentions to make not only Syria but Upper Mesopotamia another Tunis. If our support of King Hussein and the other Arabian leaders of less distinguished origin and prestige means anything it means that we are prepared to recognise the full sovereign independence of the Arabs of Arabia and Syria. It would seem time to acquaint the French Government with our detailed pledges to King Hussein, and to make it clear to the latter whether he or someone else is to be the ruler of Damascus, which is the one possible capital for an Arab State, which could command the obedience of the other Arabian Emirs. Many sources report that this agreement conflicted with the Hussein-McMahon Correspondence of 1915–1916. It has also been reported that the publication of the Sykes-Picot Agreement caused the resignation of Sir Henry McMahon. 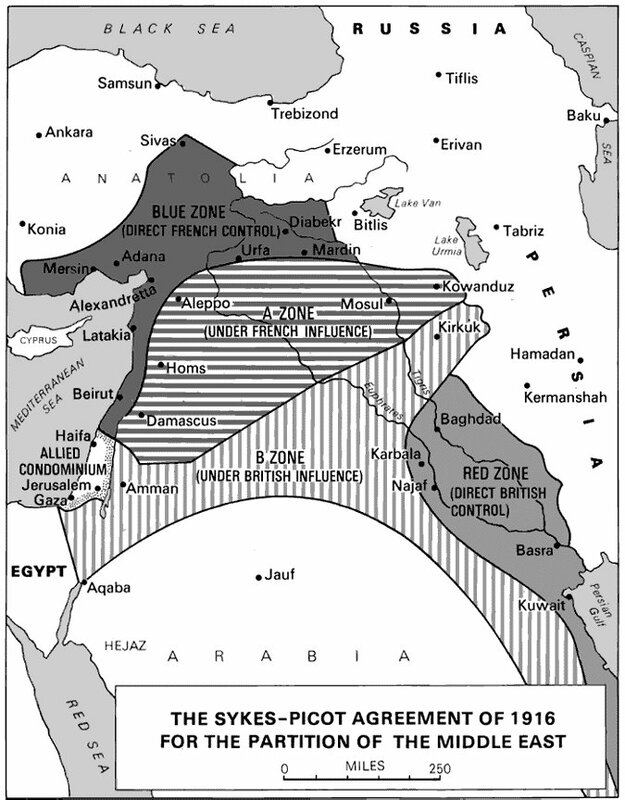 However, the Sykes-Picot plan itself stated that France and Great Britain were prepared to recognize and protect an independent Arab State, or Confederation of Arab States, under the suzerainty of an Arab chief within the zones marked A. and B. on the map. Nothing in the plan precluded rule through an Arab suzerainty in the remaining areas. The conflicts resulted from the private, post-war, Anglo-French Settlement of 1-4 December 1918. It was negotiated between British Prime Minister Lloyd George and French Prime Minister Georges Clemenceau and rendered many of the guarantees in the Hussein-McMahon agreement invalid. That settlement was not part of the Sykes–Picot Agreement. Sykes was not affiliated with the Cairo office that had been corresponding with Sherif Hussein bin Ali, but he and Picot visited the Hedjaz in 1917 to discuss the agreement with Hussein. That same year he and a representative of the French Ministry of Foreign Affairs delivered a public address to the Central Syrian Congress in Paris on the non-Turkish elements of the Ottoman Empire, including liberated Jerusalem. He stated that the accomplished fact of the independence of the Hedjaz rendered it almost impossible that an effective and real autonomy should be refused to Syria. The greatest source of conflict was the Balfour Declaration, 1917. Lord Balfour wrote a memorandum from the Paris Peace Conference which stated that the other allies had implicitly rejected the Sykes-Picot agreement by adopting the system of mandates. It allowed for no annexations, trade preferences, or other advantages. He also stated that the Allies were committed to Zionism and had no intention of honoring their promises to the Arabs. Sixty five years later, in 2002, British Foreign Secretary Jack Straw observed "A lot of the problems we are having to deal with now, I have to deal with now, are a consequence of our colonial past. .. ..The Balfour Declaration and the contradictory assurances which were being given to Palestinians in private at the same time as they were being given to the Israelis - again, an interesting history for us but not an entirely honourable one." Russian claims in the Ottoman Empire were denied following the Bolshevik Revolution and the Bolsheviks released a copy of the Sykes–Picot Agreement (as well as other treaties). They revealed full texts in Izvestia and Pravda on 23 November 1917, subsequently the Manchester Guardian printed the texts on November 26, 1917. This caused great embarrassment between the allies and growing distrust between them and the Arabs. The Zionists were similarly upset, with the Sykes–Picot Agreement becoming public only three weeks after the Balfour Declaration. The Anglo-French Declaration of November 1918 pledged that Great Britain and France would "assist in the establishment of indigenous Governments and administrations in Syria and Mesopotamia by "setting up of national governments and administrations deriving their authority from the free exercise of the initiative and choice of the indigenous populations". The French had reluctantly agreed to issue the declaration at the insistence of the British. Minutes of a British War Cabinet meeting reveal that the British had cited the laws of conquest and military occupation to avoid sharing the administration with the French under a civilian regime. The British stressed that the terms of the Anglo-French declaration had superseded the Sykes-Picot Agreement in order to justify fresh negotiations over the allocation of the territories of Syria, Mesopotamia, and Palestine. On 30 September 1918 supporters of the Arab Revolt in Damascus declared a government loyal to the Sharif of Mecca. He had been declared 'King of the Arabs' by a handful of religious leaders and other notables in Mecca. On 6 January 1920 Faisal initialed an agreement with Clemenceau which acknowledged 'the right of Syrians to unite to govern themselves as an independent nation'. A Pan-Syrian Congress meeting in Damascus had declared an independent state of Syria on the 8th of March 1920. The new state included portions of Syria, Palestine, and northern Mesopotamia. King Faisal was declared the head of State. At the same time Prince Zeid, Faisal's brother, was declared Regent of Mesopotamia. The San Remo conference was hastily convened. Great Britain and France both agreed to recognize the provisional independence of Syria and Mesopotamia, while claiming mandates for their administration. Palestine was composed of the Ottoman administrative districts of southern Syria. Under customary international law, premature recognition of its independence would be a gross affront to the government of the newly declared parent state. It could have been construed as a belligerent act of intervention due to the lack of any League of Nations sanction for the mandates. In any event, its provisional independence was not mentioned, although it continued to be designated as a Class A Mandate. France had decided to govern Syria directly, and took action to enforce the French Mandate of Syria before the terms had been accepted by the Council of the League of Nations. The French issued an ultimatum and intervened militarily at the Battle of Maysalun in June 1920. They deposed the indigenous Arab government, and removed King Faisal from Damascus in August 1920. Great Britain also appointed a High Commissioner and established their own mandatory regime in Palestine, without first obtaining approval from the Council of the League of Nations,or obtaining the cession of the territory from the former sovereign, Turkey. Lord Grey had been the Foreign Secretary during the McMahon-Hussein negotiations. Speaking in the House of Lords on the 27th March, 1923, he made it clear that, for his part, he entertained serious doubts as to the validity of the British Government's (Churchill's) interpretation of the pledges which he, as Foreign Secretary, had caused to be given to the Sharif Hussein in 1915. He called for all of the secret engagements regarding Palestine to be made public. "The Palestine position is this. If we deal with our commitments, there is first the general pledge to Hussein in October 1915, under which Palestine was included in the areas as to which Great Britain pledged itself that they should be Arab and independent in the future . . . Great Britain and France - Italy subsequently agreeing - committed themselves to an international administration of Palestine in consultation with Russia, who was an ally at that time . . . A new feature was brought into the case in November 1917, when Mr Balfour, with the authority of the War Cabinet, issued his famous declaration to the Zionists that Palestine 'should be the national home of the Jewish people, but that nothing should be done - and this, of course, was a most important proviso - to prejudice the civil and religious rights of the existing non-Jewish communities in Palestine. Those, as far as I know, are the only actual engagements into which we entered with regard to Palestine." "With regard to Palestine, His Majesty's Government are committed by Sir Henry McMahon's letter to the Sherif on October 24, 1915, to its inclusion in the boundaries of Arab independence ... but they have stated their policy regarding the Palestine Holy Place and Zionist colonization in their message to him of January 4, 1918." "The whole of Palestine ... lies within the limits which His Majesty's Government have pledged themselves to Sherif Husain that they will recognize and uphold the independence of the Arabs." Since the Sykes-Pichot Agreement of 1916, the whole mandatory system had been adopted. If a mandate were granted by the League of Nations over these territories, all that France asked was that France should have that part put aside for her. Lloyd George said that he could not do that. The League of Nations could not be used for putting aside our bargain with King Hussein. He asked if M. Pichon intended to occupy Damascus with French troops? If he did, it would clearly be a violation of the Treaty with the Arabs. M. Pichon said that France had no convention with King Hussein. Lloyd George said that the whole of the agreement of 1916 (Sykes-Picot), was based on a letter from Sir Henry McMahon' to King Hussein. The agreement is seen by many as a turning point in Western/Arab relations. It negated the promises made to Arabs through T. E. Lawrence for a national Arab homeland in the area of Greater Syria, in exchange for their siding with British forces against the Ottoman Empire. ^ Fromkin, David (1989). A Peace to End All Peace: The Fall of the Ottoman Empire and the Creation of the Modern Middle East. New York: Owl. pp. 286, 288. ISBN 0-8050-6884-8. ^ Lawrence of Arabia: The Battle for the Arab World. Director James Hawes. PBS Home Video, 21 October 2003. Interview with Kamal Abu Jaber, former Foreign Minister of Jordan. Erik Jan Zürcher (2004). Turkey: A Modern History. I.B.Tauris. pp. 143–145. ISBN 1860649580. Isaiah Friedman (1992). The Question of Palestine. Transaction Publishers. pp. 97–118. ISBN 0887382142.